On January 17th, 2011, Canada Post began issuing a new series of definitive rate stamps featuring baby wildlife. Animals and wildlife are one of the most popular topics for collectors and these new stamps will not disappoint. Cute and cuddly, fuzzy and fluffy, these stamps just make you want to reach out and snuggle their subjects! 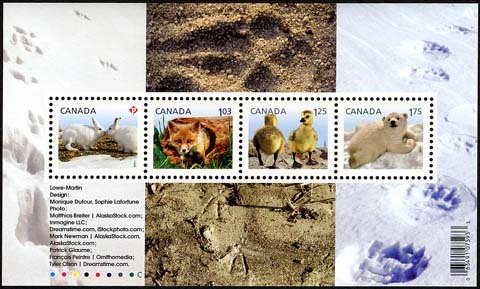 The four stamps feature the following wildlife: two Arctic hare leverets, a red fox, two baby Canada geese and a baby polar bear cub. Awwww!!! !